distribution This is a northern species whose range extends south only to NC, TN, and northern GA. In the state, it is limited to the northern third of the state, thus far recorded only in the northern mountains and northern Piedmont, with an odd disjunct record for Wilson County. abundance Rare or overlooked. Rare in the Piedmont and extreme northern mountains, and presumed extremely rare in the northwestern Coastal Plain. However, the species is quite similar to other spreadwings, and thus is presumably overlooked, as well. flight Probably June into September; this is the spread of dates for GA. The Piedmont flight in NC is from early May to early August. The single record (a sight report) for the mountains is for early July, whereas the single one for the Coastal Plain is for mid-July. habitat Ponds and lakes with emergent vegetation, even in small pools. comments Though there are seven old county records for the Piedmont and Coastal Plain, we have no recent records for these provinces, despite a moderate number of biologists. Maybe the similarity to other spreadwings is the main reason for this lack of recent records. 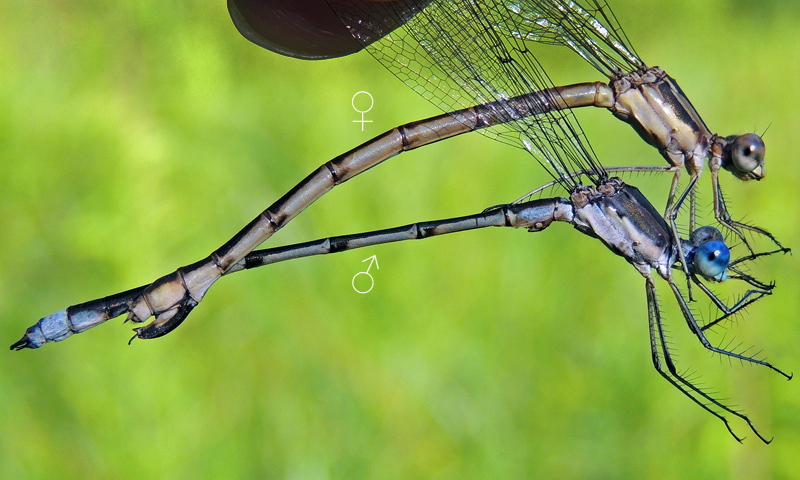 Though there are very few records for NC, the fact that few persons actually search for scarce damselflies, and some of these insects are easily confused with others, the NC Natural Heritage Program has kept the species on its Watch List instead of moving it to the Rare List. If there are no 2019 records, the species should be re-ranked as perhaps S1S2 and moved to a Significantly Rare status by the NC Natural Heritage Program.